WebPunchClock is a web-based time clock application that allows you to track the time you work online using a standard web browser. It is designed to simplify the process of tracking employee time and attendance. Easy to Use - Simple intuitive timecard interface makes tracking your time a breeze. Clock in / Clock out - Use a desktop, laptop or tablet as your fixed clock in terminal. Shift Time Enforcement - Round time up to shift start time. Round time down to shift stop time. Accurate - Works in any time zone. Get time from your PC or our server. Assign different time zones to your groups for companies with a dispersed workforce. 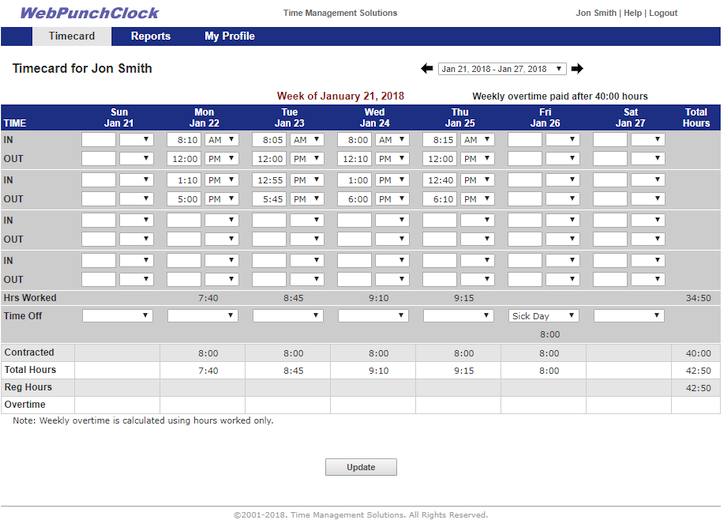 Edit Clock-ins and Clock-outs - Managers can view, approve, and edit employee timecards. Powerful Reporting - Managers can run real-time reports on employee time data. Employees can run reports on their own time data. Reduce Payroll Processing Time - Quickly and easily export time data to your PC to run payroll. No Expensive Hardware Needed - Our web based time clock eliminates the hassle of expensive, stand-alone hardware. Instead, employees can clock in/out from their desktop or tablet.